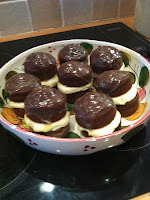 Lamb dressed as Mutton: Salted Caramel chocolate mini cakes! 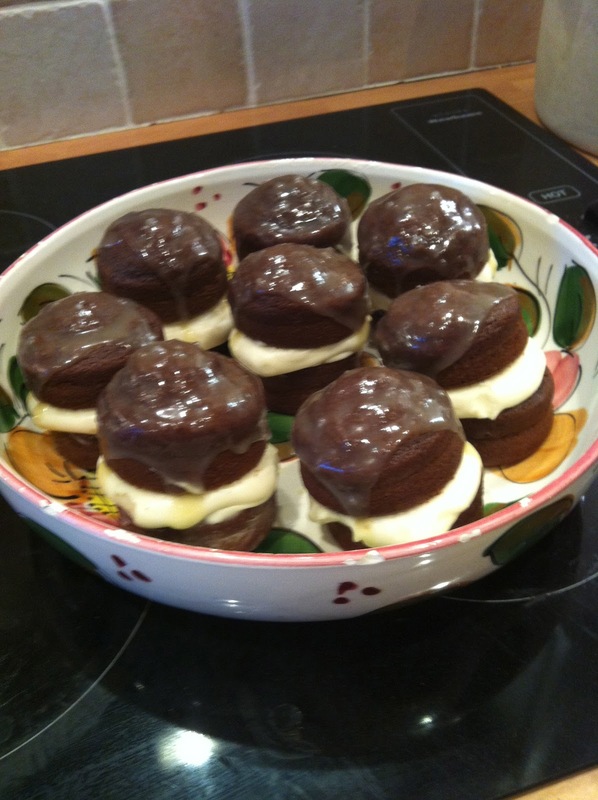 Salted Caramel chocolate mini cakes! As you can see I've decided to re-vamp my blog, which is probably for the best seeing as I haven't blogged in forever! It is now called Katie's Secret Treats, so that I can share with you my baking, because let's face it dear bloggee (yes that is what you are) there is NOTHING better than a homemade cake freshly out of the oven. I may still occasionally talk about TV, but for the moment, let's stick to all things unhealthy and purely delicious. I had too of my friends round to stay the other day and I wanted to make a really cool dessert. A while ago I bought these mini sandwich tins from Lakeland and I wanted to find some way of using them. Originally I was just going to make mini victoria sandwiches but that seemed a little boring. At easter I made these cupcakes in a jar from Teenage Granny's blog and everybody loved them, so I thought I would have another go at making salted caramel. So here is my recipe, I hope you enjoy them as much as I did! 1) Preheat the oven to 190 degrees and grease tray. 3) Cream the butter and sugar until pale and then slowly add the egg yolks. 4) Add the melted chocolate to this and beat well. 5)Put the flour, baking powder, and bicarb together in a bowl and measure out the milk with the vanilla extract. 6) Gradually add alternate milk and flour to the main mixture and beat well. 7) In a separate bowl whisk the egg whites until stiff peaks have formed and then fold into main batter. 8) Spoon mixture into prepared tins and bake for 15 or so minutes (make sure a clean skewer comes out) I made 18 halves. 9) Leave to cool in the tin for 10 minutes before transferring to a cooling rack. 1) Place the sugar and golden syrup in a saucepan with 100ml water. 2) Melt on a low heat. Make sure you don't stir, but gently swirl the pan around to stop it from sticking. 3) Once the sugar has melted, turn up the heat and cook until it looks like a golden brown colour. 4) Then turn off the heat and quickly whisk in the butter, cream and creme fraiche (be careful as it does bubble up). 6) refrigerate for half and hour before use. 1) Level off the tops of half of your cakes, these will become the bottom. 2) Spread a large helping of your cream cream icing and sandwich with another cake. 5) Sprinkle with salt crystals and admire your work! I have never written a recipe out before, so please let me know if this makes sense, and let me know if you decide to make it.